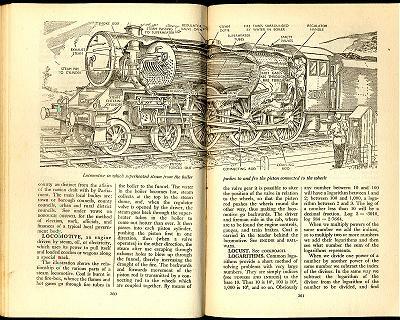 Pete's words to Meade Lux Lewis's "Honky Tonk Train Blues" were famously inspired by an entry in an encyclopaedia he had as a boy, describing the mechanical workings of a steam locomotive. Fantastic - thankyou Steve - you are the webmaster of a website of wonders! For the find, thanks are due to Pete himself. I haven't asked whether he found his own original original, or traced a copy in a library or bookshop. For the website, its present state of stagnation is entirely down to me. I hope to have at least the Smash Flops front page updated in a day or so! No, indeed it is not just any old loco. It is in fact a London Midland and Scottish Railway Jubilee class 4-6-0, designed by William Stanier and built to the number of 191 between 1934 and 1936. They worked right through to the end of steam and four are preserved. Was it just me, or did anyone else find it impossible to read this page without hearing (and singing!) the tune? No, indeed it is not just any old loco. It is in fact a London Midland and Scottish Railway Jubilee class 4-6-0, designed by William Stanier and built to the number of 191 between 1934 and 1936. It's not the one you you "see when you're watching a western", then. Here we present a stunning image of On the B[urlington] and M[issouri River] R'y near "Hot Springs, S.D.". It was taken in 1891 by Grabill, John C. H., photographer. The image shows Passengers standing in front of train and looking out of train windows. We have created this collection of images primarily to serve as an easy to access educational tool. Contact curator@old-picture.com. Pete's picture looks like Arthur Mee's encyclopedia - am I right? I don't think you are. The Mee , I seem to recall, had the page number and section subject matter at the top of the page. I of course may be wrong. I couldn't help but be intrigued by "LOCUST. See COCKROACH." No, not Arthur Mee, I'm afraid, Leslie. It's 'The Modern Encyclopaedia for Children - A Companion to School Work and Out-of-School Interests for All Young People who Wish to Know More', published by Odhams Press Limited of Long Acre, London, with no publication date given anywhere and no individual whatever credited, not even as editor. Working it out circumstantially, I think I must have been given it in 1952 or 1953. I must say that of its kind, and allowing for the consequences of the passage of time, I think it's still pretty good - well judged and well illustrated. I remember always finding it an engrossing browse without the taint of worthiness about it, and it's probably more than any other single source the root of what general knowledge I still have, particularly on subjects I just somehow seem to know without ever knowingly having studied or read about them. By the way, it would be wonderful, Steve, if the entry for COCKROACH said 'see LOCUST', but sadly it doesn't. A 1980s edition of the Concise Oxford Dictionary of Music did once have 'KETTLEDRUM, see TIMPANI' and 'TIMPANI, see KETTLEDRUM'. Treasurable - like the completely fictional entry in the Oxford Companion to English Literature. Or, as Bob Dylan wrote, "It Ain't Mee, Babe." I've just bought the 5 DVD box set of assorted Secret Policeman's Balls -- and discovered to my delight that Pete performed at the second one, Mermaid Frolics (1977), doing a stunning version of "Original Honky Tonk" with Julie Covington, backed by the Bowles Brothers -- guitar, fiddle, double bass, and a female singer called Sue Jones-Davies who did the relevant "Oooohs", who appeared in Rock Follies and The Life of Brian -- and who is now Mayor of Aberystwyth. They also do a version of "At the Hop", with Pete contributing backing vocals. I bought it on eBay for £3.50 including p&p -- worth it for this song alone; the several hours' worth of Peter Cook, Peter Ustinov, John Cleese et al are a nice bonus. ...and who is now Mayor of Aberystwyth. Wasn't that another girl singer who sang with the Incredible String Band? Rose, was it? Remarkably, both: Rose Simpson and Sue Jones-Davies have held the post. Something in the water? Curiously, it seems the BBC Website had redefined 'Comedy' -- our own links to both Footlights and Secret Policeman's Ball no longer seem to work. Mayoralty must be in the musical genes, if not in the water! I write as the former Mayor of Matlock (1983-84) ! I managed to conceal this from my work-mates at the BBC in London for nearly six months, when the inevitable happened; I entered the Radio newsroom at BH one morning to exaggerated sheep-like cries of "Meester Maaaare Sir"! Oh joy.